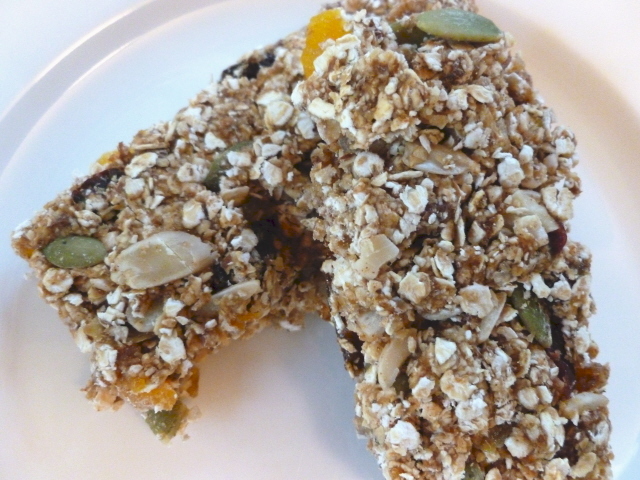 They are full of dried fruit, nuts, seeds, oats and slightly sweetened with honey and brown sugar. I don't normally have all these ingredients on hand so took the opportunity to visit the bulk food section in my favorite local market. The are very portable and I have been enjoying one lately after I run. I keep them in the freezer and just take one out to thaw before I head out. Hope you like them too! They look sooo good!! Thanks for posting! Glad you posted this recipe, I was waiting for it! I'm excited to try it out. Yum! I will be (attempting?) to make these - the look wonderful! Thank you! Yay! Definitely going to whip uo some of these, thanks! Really your MiL is a prize too? Not sure whether to be comforted by that feel sorry for you. Probably the latter. yum yum yum!!!! i love power bars! especially healthy ones!!!! !